Prime Minister Voreqe Bainimarama has launched Fiji’s first ever Birth Registration App. While speaking at the launch Bainimarama says this new mobile application is designed to make life easier and more convenient for countless Fijian families. He says this new Birth Registration mobile app will allow for the electronic registration of the birth of a child making a once slow process easier for new parents who already have enough to worry about when welcoming a new member to their families. 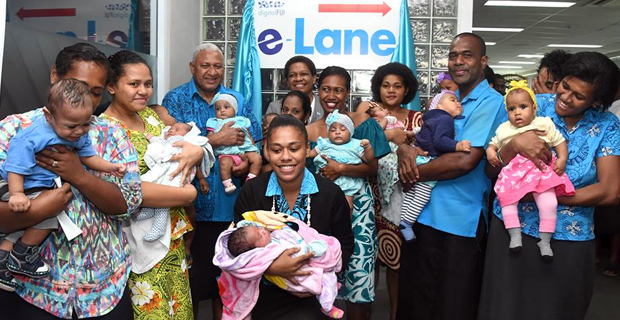 Bainimarama says through this new app, parents can now begin as soon as they decide on the newborn child’s name, be it from the hospital bed or the comfort of their own home. He says people simply need to download the Birth Registration App, follow the simple instructions on screen, and submit their registration electronically. Bainimarama says once the online registration is completed, new parents can schedule a set time to arrive at the Births, Deaths and Marriages Office, where they can then collect the birth certificate of their newborn child. The Prime Minister says for the next two years the app will not only save Fijians time, but it will save them money, as the normal fee for a copy of the first birth certificate will be waived. Bainimarama says that for the time being, this new app will only be available to register births at the Colonial War Memorial Hospital. He says during the pilot phase of the rollout they want to hear from all the new parents who use this application about how they’re finding the functionality and usability they can make improvements necessary before the nationwide rollout.